Recently I took my first cruise as a guest of Royal Caribbean on their newest cruise ship, the Symphony of the Seas. I brought my oldest son, Quinn and my dad along so we could thoroughly experience all the tween fun we could find and better understand cruising from multigenerational perspective. As a first time cruiser, it’s hard for me to compare my experience with other cruise lines. However, I will say that every single person I told about our upcoming cruise told me that Royal Caribbean was one of the best cruise lines out there. I did find the Symphony of the Seas to be extremely well run like a well-oiled machine. This is especially impressive given it is the largest ship in the world and can accommodate almost 9,000 guests and crew members. It turns out my impression of cruise activities was completely wrong, at least on the Symphony of the Seas. There were lots and lots of things to do besides sunbathing and eating unlimited amounts of food. 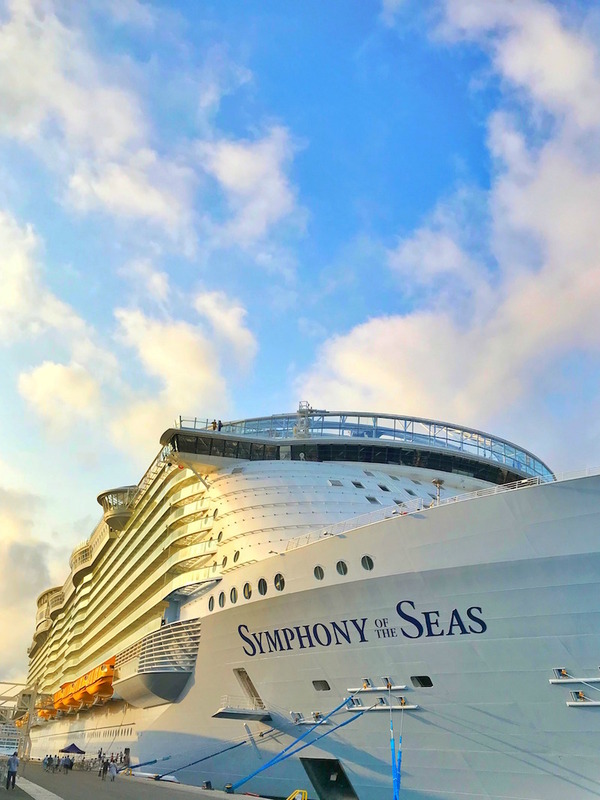 Read about why the Symphony of the Seas is the best multigenerational cruise! There were so many tween-friendly activities on the Symphony of the Seas, that Quinn struggled to find the time to do them all. Too many things for kids to do is never a bad thing in my opinion. Based on how many times Quinn asked to do each activity, I’d say rock climbing and laser tag were his two favorite things to do aboard the Symphony of the Seas. Quinn climbed on three or four separate occasions and each time, he made several attempts to reach the top. He managed to climb all the way to the top and ring the bell on our last day of the cruise. I loved seeing how excited he was to finally make it up there! Quinn would have played Laser Tag every day if he could. The laser tag game shares space with the ice skating rink, so both activities were only available on select days. We did manage to play Laser Tag twice and based on the line of kids each time, it is very popular with families on the Symphony of the Seas. I recommend anyone wanting to play Laser Tag to arrive at least 20 minutes before the scheduled start time. The zip line on the Symphony of the Seas isn’t long but I can verify that it is exhilarating zipping along 9 stories above the boardwalk. Quinn ziplined several times but found it best to do it while the ship was in port. He thought ziplining while out at sea was too windy to really enjoy. The Ultimate Abyss is a 10 story slide, the tallest slide at sea. All three of us enjoyed going down it. It starts on the top deck and you slide all the way down to the boardwalk on the 6th deck. Perfect if you are ready to grab a bite to eat at Johnny Rockets or ride the carousel. The guys played table tennis several times during the cruise. They always found an empty table to play on in the mornings. I noticed the tables were much more popular during the afternoons. Minigolf was very popular on the Symphony of the Seas. We always saw families playing minigolf during the cruise. We played on one of the mornings we opted to say on the ship. I noticed minigolf was also quite popular with groups of tweens and teens hanging out together on the ship. There are two arcades on the Symphony of the Seas, one on the Boardwalk and one on the 15th deck. The arcade costs money so we didn’t use it every day but Quinn did enjoy it more than a few times. There is a sweet carousel on the boardwalk and we found both kids and adults enjoying it most evenings. Quinn might have indulged me on riding the carousel but I know some tweens would love it. Quinn is a huge fan of water slides, so he couldn’t wait to check out the water slides on the Symphony of the Seas. He even sweet talked me into sliding down a few times. There are also a couple of smaller slides in the splashpad area as well. There are two splash pads and a few small pools on the Symphony of the Seas. One splash pad was designated for toddlers, making the other one fair game for tweens to play on. There are two Flowriders aboard the Symphony of the Seas, perfect for anyone that wants to ‘surf.’ It is one of the activities we didn’t get around to trying out during our cruise. It’s free for guests to do but private lessons are also offered for an additional fee. The Rubicon is an escape room style activity on the Symphony of the Seas. Instead of escaping a room, you try to solve puzzles to save the world. Unfortunately, we failed our mission but we were successful in having fun. This activity is also an additional fee and reservations are recommended. We didn’t see EVERY live show on the ship but we saw quite a few including the water acrobatic show, Hero, an amazing magician, and their exclusive Broadway-style show, Flight. Quinn enjoyed every single one of them. I wish we had managed to see a few more. Each one was only scheduled a few times during the cruise, so it was tough fitting it all in. You can also catch newer movies in the Royal Theater or outdoor Aqua Theater. Tomb Raider and Coco were a couple of the moves shown during our cruise. We walked through the kids club but Quinn didn’t have any interest in it. I think he felt too old for what he saw. We toured it on the day we boarded and didn’t see any other older kids in there at the time so that might have made a difference. If his younger brother had been on the cruise, then perhaps they would have enjoyed some of the scheduled activities together. There is a dual purpose sports court on the upper level of the ship with basketball hoops and soccer goals. Quinn and my dad shot hoops one morning while we were exploring the ship. Another day we caught a basketball tournament for staff members, each team clearly representing a different job or section of the ship. Sugar Beach is the candy store located on the Boardwalk. It offers a cupcake decorating class for an additional fee. Quinn and I both enjoyed it and our frog cupcakes turned out pretty cute. I really wanted to go ice skating while on the cruise. We even packed pants and long socks so we could participate but the timing just didn’t work out. There are lots of tween-friendly food options on the Symphony of the Seas. Sorrento is the pizza place located on deck 5. Both my dad and Quinn loved their pizza. The upper deck offered a Mexican style quick dining experience complete with tacos, nachos, and burritos. And Quinn’s favorite food option? Dessert of course. We found lots of dessert options at the premium dining restaurants and the Windjammer, the ship’s signature buffet dining experience. There are also two self-serve soft serve ice cream stands on the upper deck near the pools. Our cabin on the Symphony of the Seas was reasonable for the three of us. My dad took the sofa sleeper and Quinn shared the king bed with me. If it had been me, my husband and two sons, it would have been a tighter fit. The sofa sleeper did have a pullout trundle bed below, so both of my tween sons could have slept on it. The key to our cabin being comfortable was the balcony. We utilized our balcony to eat breakfast each morning, and watch the shoreline pass by as we cruised. Quinn also enjoyed watching the boats and other happenings in each port. With two tweens, we could make the room work but I think as my big kids grow into teens, it would be less comfortable. I do believe this would be an issue on any cruise ship though, not just the Symphony of the Seas. Have you taken a cruise before? What have your kids, tweens or teens loved most about it? Disclosure: We were guests of Royal Caribbean aboard the Symphony of the Seas. As always, all thoughts and experiences are our own.